Hello Summer! Today’s the first day of summer. WOW! It has been over 4 ½ months since my last post. What have I been doing since February? , I’ve traveled to Nashville and had an amazing time touring the city and sampling the delicious food with my best buds, joined a fitness challenge at work and lost over 25 pounds through eating healthier and exercising, and spent mucho time with my family. ALSO, my wife and I are expecting our second baby girl this September. A lot of exciting things are happening. Now that summer is starting, it’s time to stop neglecting this blog and start sharing some more recipes! So here is the first post to kick off the summer! Every time I go to Vietnamese Sandwich shops, 75% of the time, I get the normal Banh Mi Thit Nguoi (Ham)– Vietnamese Sandwich. 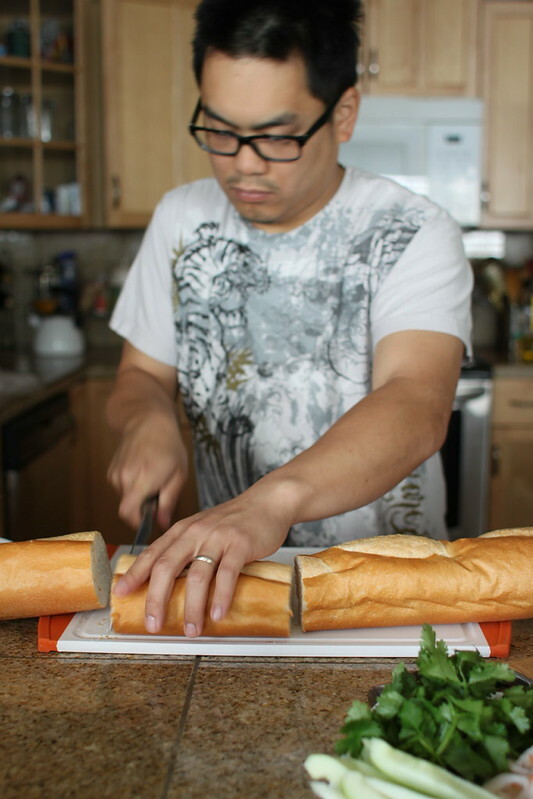 On a trip to Thanh Huong Sandwiches in San Jose a few months ago, I felt adventurous and wanted to try something new. 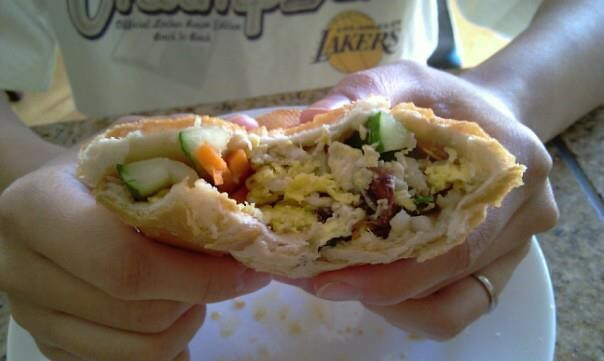 I ordered a Chinese Sausage and Egg Sandwich. 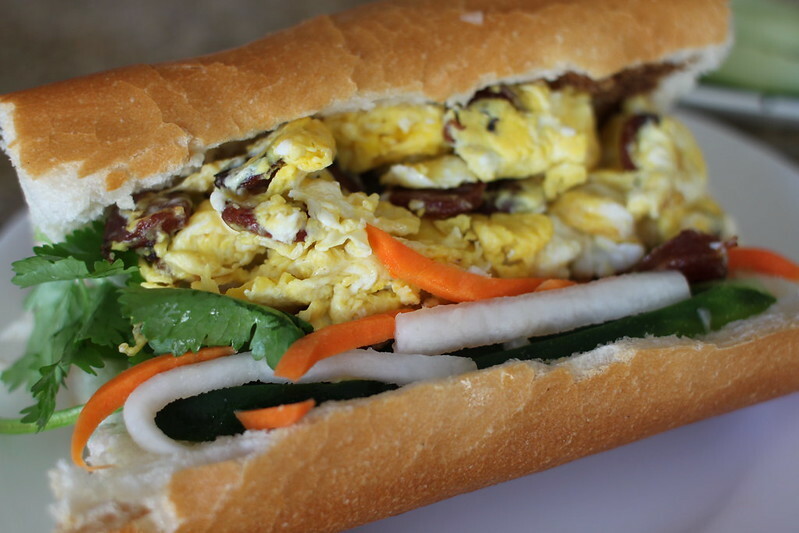 I am so glad I did because for 4 straight weekends after that, I stopped by Thanh Huong Sandwiches every Saturday morning to get a Chinese Sausage and Egg Sandwich for breakfast. 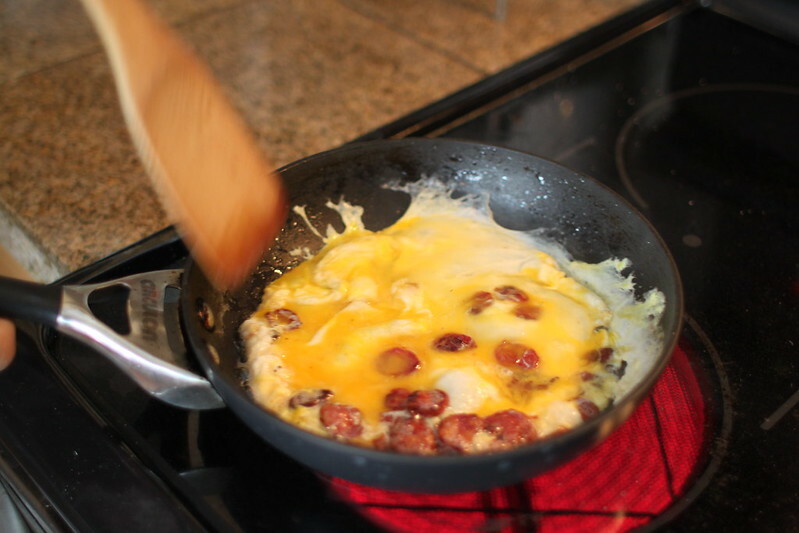 The sweet and salty Chinese sausage paired so well with the fluffy fried egg. Add in the pickled carrots and daikon, cilantro, sliced jalapenos and delicious warm bread and you get the perfect breakfast sandwich. OH MY MY! This is a really easy recipe. I spent more time gathering and prepping all the fresh ingredients than actually cooking. 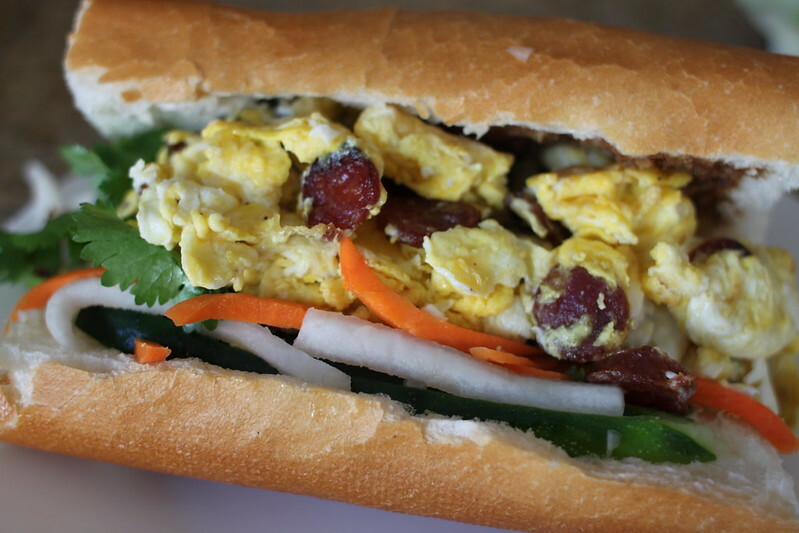 You just need to get some good Chinese Sausage (I prefer Kam Yen Jan brand), egg, French bread, and whatever accompaniments you like in your Vietnamese sandwich and start assembling the perfect breakfast sandwich! 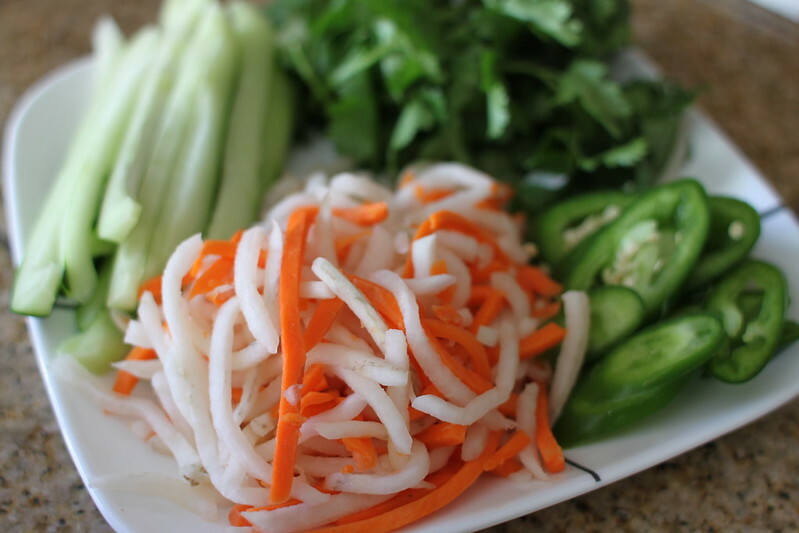 If you don’t have time to prepare this, you can just go to Thanh Huong Sandwiches and get it for 3 bucks. Heat a small non-stick frying pan to high heat and add vegetable oil. 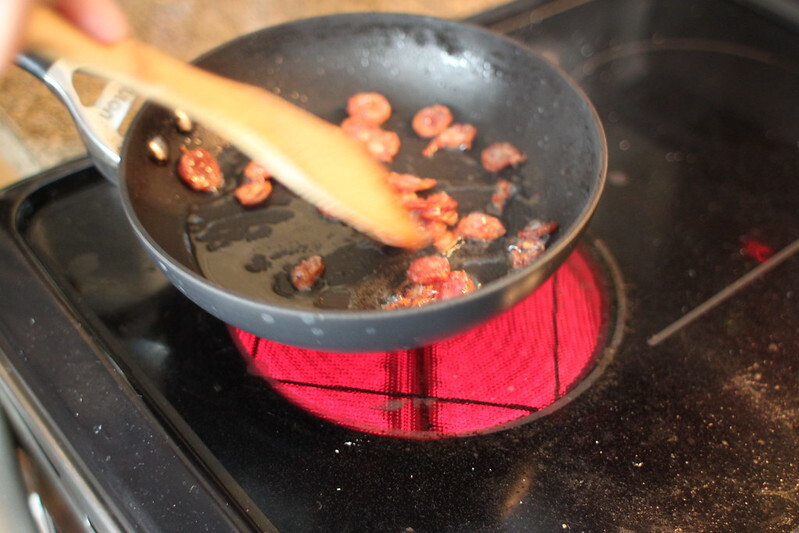 When pan is really hot, cook Chinese sausage for a few minutes until browned, but not completely crispy. In a small bowl, add eggs and break yolk, season with a pinch of salt and pepper, and add to frying pan. Turn off heat, and cook egg flipping once to cook both sides evenly. Slice French bread lengthwise, assemble sandwich with Chinese Sausage and Egg, plus your favorite sandwich accompaniments. Enjoy! what?! this looks delicious! gotta try that.